This powerful keynote will entertain and inspire your students by encouraging them to bring back their grade two enthusiasm and "get your hand up" to participate in class, in school, and in life. In this presentation, Andy encourages students to overcome their fear of failing. He urges them to ask questions, answer the teacher, and try their best in the classroom. He inspires his audiences to volunteer and get involved in all of the great activities, both at school and in life. Throughout his presentation, Andy tells students to take advantage of their time in school both to LEARN and to have FUN. Why don't students "Get Their Hand UP?" The fear of failure or of being wrong in front of their friends. They worry that they might give a wrong answer, ask a stupid question, learn that their "best" is not as good as others, or volunteer for something and then get "cut" from the team or play. Andy challenges youth to bring back their grade 2 "recess attitude" which says, "I will get knocked down and I will be wrong sometimes, but, just like at recess in grade 2, I will get back up and play again!" Teenagers have no problem caring! They care a lot about the "stars" on their favourite teams or singing their favourite songs. Andy encourages students to bring that care to school! For only a few years the "stars" of your school teams, events and stages share something incredible with you! They go to your school! They are your friends and schoolmates! "How are you going to care?" is Andy's challenge to your students. Care comes in many forms: being attentive in class, going to the play, attending spirit events or bringing in a can for the food drive. Listen … to the teacher, to your parents, to the boss, to your friends! Participate … dress up for spirit days, cheer at a game, put your hand up in class. Show UP … to events, to practice, to work, to class! It makes school and life more FUN! You change the world, because caring knows no borders! Care creates a yearbook full of memories that last a lifetime! Andy challenges students to be an example of care for others to follow. "I wanted to let you know how much I appreciated you coming and talking to us yesterday. It is evident that you really care about leadership at school, and about training kids to effectively lead at their schools. A lot of what you said really made sense and made me think. Today at our student council meeting, someone brought up the fact that our volleyball team's first game is coming up and wanted to make signs advertising their game. That would have never happened if you had not have pointed out the "less important" (as most people see them) sports!! So we are going to put up signs, and they asked the student council to go and cheer. Thank you so much for caring about leadership in our schools!! Your care is contagious, evident, and effective!" In ten years of sponsoring student events, there are always those same teachers that oppose, or find something wrong with whatever the event is, but I receive nothing but overwhelmingly positive feedback, and LOTS of it. Our principal says that you are Jim Carey with a message. Another teacher said that they never stopped laughing, but realized at the end that there was a lot of material to take away. Our Student Government has struggled for the last several years with how to build school spirit where none exists. Every dance is cancelled each year due to lack of student interest. Sports teams are barely supported, etc. After your presentation, students are trying new things, deciding to get involved in class and extracurricular activities. Our only job now is to keep alive what you have started! Thank you! When Andy is asked to be part of an Anti-Bullying program, a growing area of Andy's business, Andy uses his "Share Your Care" presentation. Staff and students appreciate that the angle of this program is a “do this, do that” type of speech rather than a “don’t do this, don’t do that” message. When you care, when you let yourself do those little acts of caring that make a big difference (show up, participate and listen), you make decisions that lift people up in your school rather than tear them down in a bullying way. This makes the program fun and uplifting and avoids using guilt or shock in order to get students to think about caring. 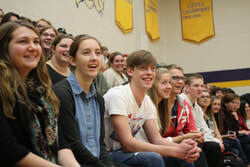 These presentations have been used at assemblies as part of spirit weeks, anti-drinking and drug campaigns, teen issue awareness days, yearbook sales promotions, Character Education initiatives, Anti-bullying programs and at hundreds of general student body assemblies for any month during the school year. What makes Andy's assemblies unique? He personalize each presentation to the school he is visiting. He promotes upcoming events and activities while highlighting past successful events. Students and staff are thrilled when he encourages students to participate in specific activities such as the next dance, fundraiser, spirit event, play, music event, or spirit day. Andy arrives at the school early to discuss upcoming events at the school. Andy can perform up to 4 assemblies back to back in order to accommodate your school's size and seating. He can adjust the program to between 45 to 90 minutes in length. He prefers a minimum of 60 minutes. "You really taught me a lot about leadership and being a person. You are a really awesome speaker and I can't say that enough. Never have I seen the whole entire school react to anything the way they did your presentation. You were fun, energetic and challenging and I really appreciate everything you have done." Making Care Contagious - STUDENT LEADERSHIP "FUNSHOP"
“Care is contagious, but as a leader it must start with ME! How do I get my care out there?” This session will answer that question! This workshop is an excellent follow-up to Andy's assembly as it empowers leaders to continue with the message that he delivers to the student body. This one hour to two hour workshop (flexible to your schedule) offers youth leaders helpful insight on effectively communicating their care for the school to the students and staff. The presentation draw's on Andy's years of experience as a student leader and as a speaker traveling the continent. The fee includes a copy of the workshop's guidebook to help you in your follow-up. The workshop is appropriate for 20 to 150 leaders from all of your school’s groups, councils, clubs and teams! "The assembly presentation was so uplifting and energizing. All of us laughed and at the same time were warmed by the genuine honesty in Andy's presentation. During the assembly I watched students laughing so hard they covered their faces and heads. It was really cute to see our kids have so much fun in the middle of a dreary winter month. Our students came out of the auditorium laughing and smiling. The reflection questions provided for classroom teachers were very powerful - several teachers spoke to me later about the message and how much our students enjoyed Andy. As Andy and I were walking down the hall from the last assembly, students stopped him, thanked him and asked for hugs He is an amazing speaker and truly connects with young people. The student leadership workshop was fabulous. Even though we have an extremely talented group of confident and intelligent leaders at Oakridge, Andy had them reciting powerful messages, doing hand signals that reinforced concepts and they loved every minute of it!" Andy is the teaching profession’s #1 fan. This is because of the difference teachers have made in his life. It also helps that he married a high school French teacher! This 30 to 60 minute program is an empowering reminder to your staff on the difference they make with youth. In October of grade 9, Andy received a letter from his high school’s track and field coach “recruiting” him to be part of the team. That letter changed his life. Expect tears of laughter and powerful reflection as Andy shares the lessons he learned from Coach Young and his efforts to connect with students. Each year over 30 schools add this after school staff program to Andy's visit. Get Your Hand Up Grads! Andy has created a special “grads only” version of his “Get Your Hand UP” assembly. With examples from students who were bound for university, college or work, he uses powerful stories and hilarious comedy to inspire and entertain. Andy reminds your graduates that Success is not about the stuff you buy, own and collect. He challenges them to share their care because "when you help others reach their dreams, you accomplish your dreams quicker!" Grads will feel empowered to take on the challenges of post-secondary school and work situations and will also see how volunteering is so important to helping themselves and the world. Parents' Presentation - "Laughing & Learning! The Power of Parenthood"
Andy uses powerful and hilarious stories to highlight the power of the individual to make a difference. He challenges leaders in the lives of young people with the statement, "If care is contagious, it has to start with you!" Andy shares simple yet powerful examples of caring that remind parents and caregivers that their extra efforts DO make an impact with young people. It's not easy being in the "business" of working with youth. Andy's presentation acknowledges these challenges by sharing his most powerful conclusion of all: "be the best YOU that YOU can be! It's all this world can ask of YOU!" Andy understands the challenge of balancing work, family, and volunteering. He is a parent of two girls, and an active member of his church and community in London, Ontario. His wife Lizz taught high school French for six years before becoming a full time mom and church volunteer. All of Andy's presentations reflect his joy in speaking to the continent's schools. Andy loves to make people laugh … He loves to make people think!